For people who have a love of both art and helping others, becoming an art therapist is often a career to consider. Whether interested in working with children, adolescents, or adults, art therapy professionals are able to use everything from painting to sculpting to assist with issues ranging from fine motor skill development to mental health. The minimum requirements for entering into most positions in art therapy are to complete an undergraduate degree in the field or in one directly related to it. In some cases, future professionals can complete a degree in art and a separate degree in a field such as psychology. 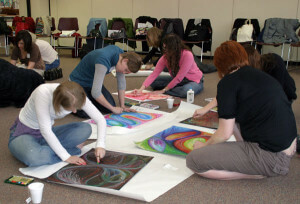 Art therapy programs at the undergraduate level include a variety of courses, including several art classes. These are likely to include Western art, medieval art, and history of photography. In addition to these courses, students will also complete classes such as principles of art therapy, art therapy in the studio, concepts of professional art therapy, art therapy internships, and working with specific populations and art. After completing an undergraduate degree to gain the basic foundation and knowledge needed to work with people using art as therapy, prospective and current professionals in the field might also consider completing a graduate degree. A master’s degree will typically include courses such as group art therapy, art therapy and adults, art therapy and children, and art therapy and adolescents. According to the Art Therapy Credentials Board, obtaining professional certification through the board is also often required. Art therapy professionals are able to help a number of different types of people. In some cases, art therapists are able to work with children to develop fine motor skills, using crayons and paintbrushes to learn how to better control hand and muscle movements. Adolescents and adults, too, are able to use art therapy to overcome conditions that might limit mobility in the hands and arms, such as after suffering a stroke or for a degenerative condition. Another area where art therapy is commonly used is in mental health settings. The benefit of art therapy comes from the ability of allowing someone to express feelings, helping to identify and diagnosis issues for treatment. An art therapist might incorporate drawing, painting, sculpting, or any other type of art to help people of all ages in this way. This requires for art therapists to have ability in not just all types of artistic expression, but it also requires the ability to work with people. Empathy, communication, interpersonal skills, and critical thinking are all qualities that allow for an art therapist to successfully help patients. Art therapy is increasingly becoming a standard form of working with people who are in need of counseling or physical therapy. A professional therapist specializing in art is likely to find possible positions in hospitals, outpatient physical treatment facilities, in-patient medical treatment facilities, private psychiatric practices, schools, residential treatment centers, and rehabilitation centers for substance abuse. There are a number of different options for people who love art and working with others to consider for their future career paths. Art therapy provides a number of a rewards, both professionally and personally, for anyone who wants to combine a passion for art with helping people.